Carmen Jorda at the Chinese Grand Prix in 2015. 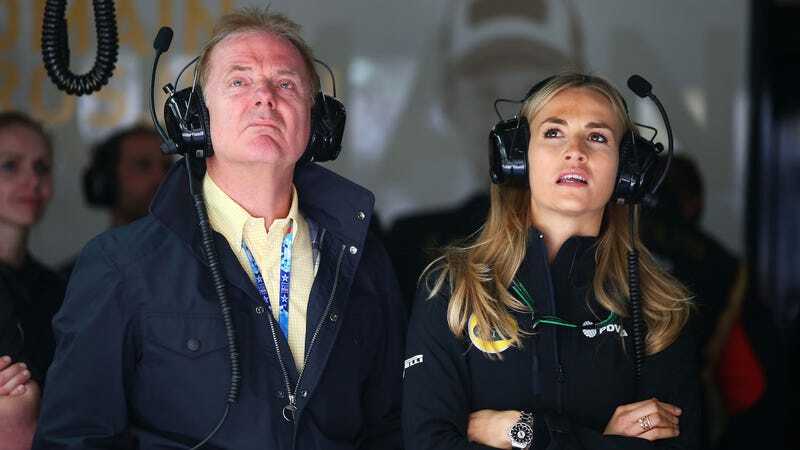 When a person like former Lotus Formula One development driver Carmen Jorda talks about how women are less capable as racing drivers than men—and she does, a lot—there’s an urge to treat it as an offhand comment with no merit. That’s particularly true when the person has a history of not helping the people they’re speaking about. The latest example Jorda’s troubling comments came after she drove an electric FIA Formula E race car before the series’ race in Mexico City last weekend. After she got done, ESPN reports that she said it’s a series more women should focus on reaching. According to ESPN, someone asked Jorda if she thought a Formula E car is easier to drive for women—which, it’s a story in itself who asked this why they thought it was an appropriate or beneficial question to ask, but we’ll save that for another day. Jorda said she thinks so, as quoted by ESPN. That’s an expected answer from Jorda, who, despite having beaten men in her racing career, thinks women cannot compete with men in motorsports. “It’s a less physical car than in Formula One because of the downforce and because of the power steering as well. So yes, for sure. The challenge that we women have in Formula Two and Formula One is a physical issue and I think in Formula E, we won’t have it. Even worse than Jorda’s consistent narrative about women being lesser than men behind the wheel, while other women are out there trying to prove the exact opposite, is the idea that her regressive comments are newsworthy. While a Google search doesn’t provide exact numerical data of how much a topic gets covered in the news, it’s clear that one woman’s opinion—a woman whose opinion is constantly rejected by other women in the sport—sets a bigger fire than the opinions of others: A female Indy 500 qualifier gets one hit on Google with her response to Jorda, while the exasperated responses of other women like two-time IMSA GT Daytona champion Christina Nielsen and Le Mans engineer Leena Gade are nowhere to be seen. When it comes to talking about diversifying a sport or any field, one person’s opinion shouldn’t be covered exponentially more than the opinion of others in that same demographic. That’s particularly true of a person like Jorda, whose comments do more to hurt the potential of women in racing than they do to help. There are plenty of successful women who express concerns about Jorda’s comments publicly, and plenty who agree, yet Jorda often gets the spotlight. Women, or any other underrepresented demographic in a field, shouldn’t be boiled down to the few women people can name. Not every young girl is the “next Danica Patrick,” just like Patrick is more than simply her yoga photos in bikinis. Not every female racer agrees with Jorda, and that’s a nice way of saying it, yet she’s one of those names that’s easy to tack onto a story and run with. While it’s preferential as a woman to brush Jorda’s comments aside and move on, that can’t happen until others realize that women in general can’t be put in categories. It’s time to learn that there are plenty of successful women who participate in motorsports, and media outlets don’t have to keep going back to the women whose names they can remember for quotes. Until outlets can learn to look harder—to ask Gade, Mann, Nielsen, Simona de Silvestro, Jennifer Jo Cobb, Susie Wolff, Claire Williams, Ashley Freiberg, Gosia Rdest, Brehanna Daniels, or countless other women in motorsports how they feel about the issue, or to treat their comments about women in racing (or any other issue) as just as important and newsworthy as Jorda’s, we’re stuck in this absurd, damaging loop that keeps certain people and opinions in the spotlight. And, like Jorda, none of those women can speak for every woman, every time. Inclusiveness is a conversation, not a monologue. If every empowering, positive quote from every woman—even those with mediocre racing records, like Jorda’s—made the news like Jorda’s comments do, we’d have a lot more coverage of women in motorsports. But we don’t, because Jorda’s made her name an easy one to remember. And thus, the lazy cycle of publishing her views as some sort of revelation continues.